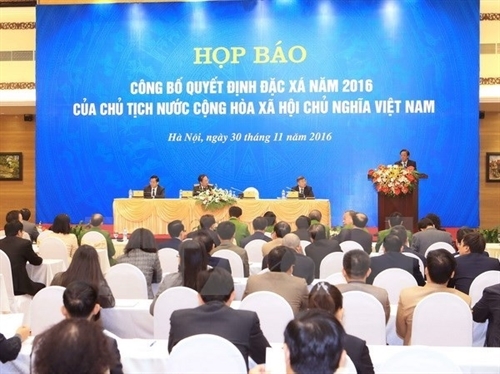 A press conference was held in Hanoi on November 30 to announce the President’s 2016 amnesty decisions for offenders who are serving prison sentences and those having their sentences postponed or suspended. The event was co-organized by the Presidential Office, the Ministry of Public Security, the Supreme People’s Court, the Ministry of Foreign Affairs, the Governmental Office and relevant agencies. Vice Chairman of the Presidential Office Giang Son announced the decisions, which will grant amnesty to 4,180 prisoners, 186 criminals having their sentences postponed and 18 others having their sentences suspended. The decisions will come into force from December 1, 2016. Son told the press that the Vietnamese Party and State have given amnesty to many offenders who showed good rehabilitation process. The 2016 amnesty decisions continue to reiterate the Party and State’s clemency policy and the national humanitarian tradition, he said. He added that this year’s regulations are stricter; hence, the number of released offenders is fewer than that of previous years. The amnesty decision-making was conducted earnestly, publicly and democratically to ensure equality for all criminals without discrimination if they are Vietnamese or foreigners, he stressed.